Hi There! Welcome to The Yoga Barre's home on the world wide web. We are so glad you stopped in to check us out and hope we get to see your smiling face in class soon! I'm a wellness junkie, owner of The Yoga Barre and a woman on a mission! Let me introduce you to what I call the S.Y.A. moment: that moment when you realize there's no night in shining armor coming to fix everything and its going to be 100% up to you to Save Your own A$S (pardon my french). Well, my S.Y.A. moment came after 3 years of deeply trying struggle that started with two car accidents and culminated with one BIG FAT case of ILLNESS. I'll spare you the gory details (your welcome) but let's just say it included an extreme amount of pain, exhaustion, depression, weight gain, stomach aches, migraines, and helplessness. I'm talking so far gone that taking a breath felt like work. Long story short I dedicated the next 10 years of my life to finding a way to TRULY heal and now I'm here to show you how you can do the same. You deserve to live in a state of complete bliss and there's no reason you can't start feeling it today! 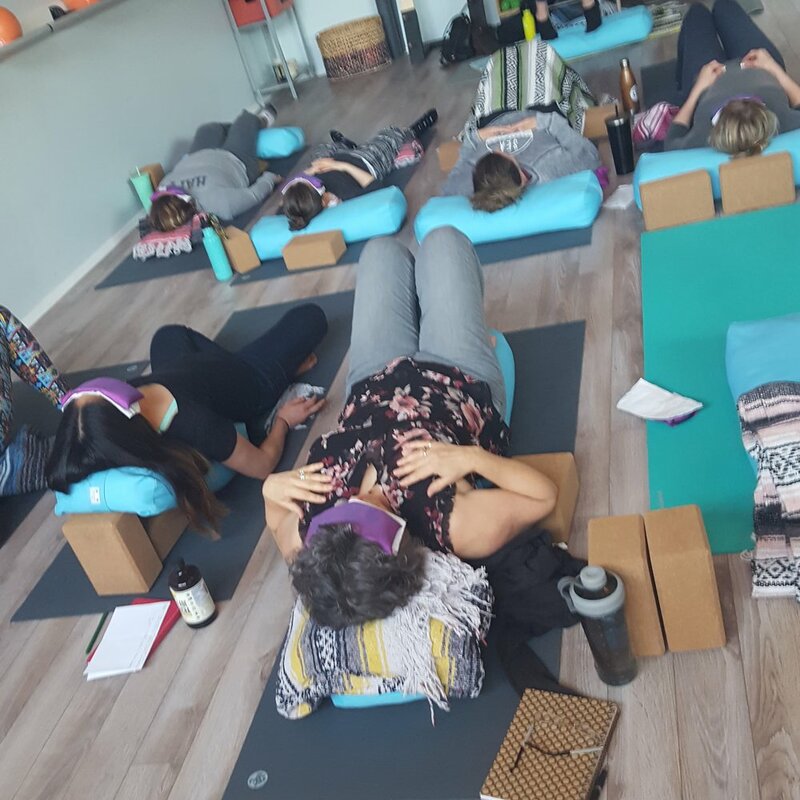 We are a fun loving group of wellness pros and instructors dedicated to creating a unique and special place for you to come as you are, grow, learn and share. This is a community of positivity where you can recharge, challenge yourself, and step forward on your journey toward health and happiness. We aren't your "typical yoga" experience. We are so much more than that. You can think of us more like your wholistic wellness "home," or even your body mind spirit gurus. Our community is perfect for all levels of fitness/wellness - everyone is invited to join us! We are dedicated to maintaining a 100% chemical and toxin free space. That means we wash everything with magic reusable cloths, water, steam, and essential oils. To make sure we do our very best for mother earth we produce as little paper waste as possible, striving to be a paperless business. Everything we do helps you have a clean, inspired, experience. We love that you can come here, take care of your body, and know that we are all doing a small part for our planet. Want to come try a class? For your first session, please arrive 10 minutes before class starts so we can help get you settled in and show you the ropes. We will open the parking lot at the black pearl before class, lock it a few min. before start time, and unlock it after class. Please be sure to arrive at least 5 min. early every class. We are very careful about starting and ending our classes on time, so that you can keep up with the flow of our busy life. Because our drop in classes operate on a donation basis (space, instructor, and students), classes may very each week. We hold a flexible schedule but strive to at least have it set one week in advance! Did you know we offer a 200 hr Hatha Vinyasa Yoga Teacher Training near Vancouver, WA-Portland, OR?